No need to be weary of the calories, because the P5 is fat free! "There's a story behind the book, too: Plasket had to self-publish after two publishers withdrew, apparently scared off by warnings of litigation from the attorney for one of the female accusers. He wound up delivering copies to bookstores from the back of his Chevy Cavalier, but his persistence paid off. "Buffaloed" has emerged as a hot seller for the Colorado-based Tattered Cover Book Store chain, hitting No. 3 on the state's best-seller list for paperback nonfiction." (2) Sell books out of the back of your Chevy if you have to. This article on the National Book Awards discusses the "reprinting" of many of the winners--that is, how big the second (or beyond) print runs would be since the books have won their awards. "William T. Vollmann has received little attention from book buyers. But that could change now that he has won the fiction prize for EURPOE CENTRAL, intertwined stories about World War II. His publisher, Viking, says it is printing 35,000 copies in paperback. "Vollmann is exactly the kind of writer literary awards were made for," Viking's Paul Slovak says. "I don't think he's ever had a book that has sold more than 15,000 copies in either hardcover or paperback. ... So he's made a giant leap." See? An award-winning author (now) having never sold more than 15,000 copies per book? To makes things simple, let's say he gets $2 per book. That's $30,000. Hard to make a living at this racket. If you write, do so because you love it. I do. And I still have a day job that is paying the bills--and providing health insurance. (1) They have officially formed a partnership with Google Print. While there is much debate about the copyright issues here, believe me when I say the best thing for a self-(or under-) published author is exposure--and if that means getting your book noticed via a Google search, so be it. (2) They now have a service that guarantees your book will be produced in 30 days or less (you will have it in hand in 30 days.) And that's pretty swift. The only way to beat that (that I know of) is to produce it yourself via Lulu. Well, thanks for stopping by. Nothing better than sharing some blue-veined cheese with a few thousand friends. We'll have a big old ruby ready for you Monday. And from the "Don't-light-a-match-near-all-that-methane" department . . .
PublishAmerica is using the unusual success of one of their authors to promote their backlist of dreck. My apologies if I just blew your mind--but if I did, you must be new here. "Today we are congratulating your fellow author Benjamin Frazier, who is well on his way to becoming a Hollywood celebrity! His PublishAmerica book "Shelly's Diary" [misspelled on Amazon, I should add] is currently being filmed on location in North Carolina, starring Stella Parton (Dolly's sister) and Traci Dinwiddie (Dawson's Creek, The Notebook). The big-screen release is certain to create a buzz, and you may expect the film to show in a theatre near you! Seeing your book turned into a movie is every author's dream, so here's to Ben Frazier, with pride!" This is wonderful news for Mr. Frazier but "big screen" is not a term I would have used. Neither is the phrase "create a buzz" or anything similar. And crediting Traci Dinwiddie with starring in The Notebook is a little misleading. Sideways was a blockbuster movie but only generated moderate sales for Rex Pickett. So . . . grain of salt, you know? The rest of the email (another eight paragraphs or so) go on to fling useless PA statistics around like "every 90 seconds someone orders a PA book" or eight times a day someone runs out of Charmin and reaches for a PublishAmerica novel or some such garbage. Currently Mr. Frazier's book (which I have not read) is ranked well above 1,000,000 on Amazon. Looks the Hollywood buzz hasn't started yet. Hey, who says I don't review books that are timely? Well, no one, actually--at least not yet. In any case, here is some cutting edge proof: Publisher's Weekly just listed a deal that, although in memoir form, sounds almost identical to the book I reviewed two days ago. David Matthews' ACE OF SPADES, about growing up the son of a black man and a white, Jewish mother who abandoned him at birth, describing life on both sides of America's color line, to Vanessa Mobley at Holt, in a pre-empt, by Kate Lee of ICM (NA). What are the odds? Good. Because some POD titles (like 1 in 500) are just as timely, as thought-provoking, and well-written as everything by the majors. No go read ONE SISTER'S SONG. If you are not an ardent reader of Robert Gray's blog (then spank yourself three times) you very well should be. Today's entry deals with the Wessex Collective, which is essentially like a publishing commune. But that's not what I am here to address. The real story is the struggle this noble group is going through to gain (bad word: they should have it by default) legitimacy in the eyes of the bookselling world. "Not surprisingly, the main problem confronting our small publishing venture is the same problem that confronts individual authors who self-publish. Because we are publishing our own works the fact that most of us have been published by other companies, ranging from tiny Plain View Press in Austin, Texas to huge Random House and St. Martin's in New York, doesn't really offset the stigma that attaches to self-published authors in this country.
. . . Most of the people who focus badly needed attention on literary endeavors still refuse to take a chance on self-published work. One example: The New Pages, which used to list a literary journal published this past quarter century by one of our authors, still would not mention the novel he has written and we have published. By mistake, I received an exchange of emails between two of the New Pages editors: one said "looks a little like self-publishing to me" and the response was "looks a lot like it to me" or something to that effect. Getting past this prejudice is going to be a major hurdle." She (Sandra Sanchez, the guest blogger) goes on to discuss how books are increasingly being "judged by their covers" and how apparently size does matter, in some cases. These are the exact issues being dealt with among the POD world--though probably worse; the only thing more loathsome (in the eyes of the publishing world) than being self-published is having done so via POD. And something needs to break this cycle. POD and self-publishing is not about a few bad apples spoiling the bunch, it's about a sea of rotting fruit with a few shiny, red apples bobbing along in the tide. And, as you can see, the curse of self-pubbing is taking some traditional instances with it. Instead of publishing brining up a few good vanity titles, the vanity world is starting to pull the traditional industry down. Heaven help us if we have to rely on Random, Simon & Schuster, Penguin (though they do publish some great stuff) and Warner to provide all the books in the world. Your kids will be reading COMA and THE FIRM as required reading in high school. Do me a favor, if you don't want to try one of the POD titles listed on this blog, at least go to a local small book store--one you've never even been to--and find a salesperson and ask, "Do you have any good books you could recommend?" Then, after buying three books from publishers you've never heard of, order a copy of any title from the Wessex Collective. We've already considered this plot in our books and movies: What is it like to be a black person in a white world? And we've considered this, too: What is it like to be a white person in a black world? But what about this: What is it like to be a biracial person in a world that is almost always black or white and nothing in between? 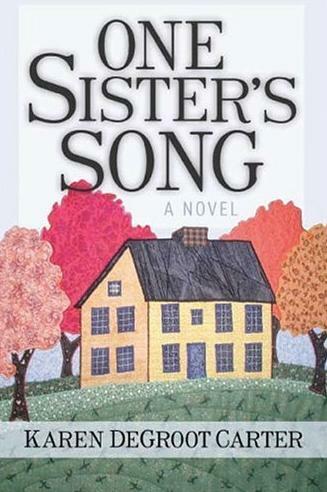 Karen DeGroot Carter addresses this idea in her melodic novel, ONE SISTER'S SONG, published by Pearl Street Publishing (which uses Print-on-demand for its production model.) Actually, this book touches on (and deals effectively with) many issues besides race (family issues, grief, love--among others) but never before have I read a novel that captures the essence of the shifting nature of racial identity. SONG tells the story of Audrey Conarroe (who is biracial) who is forced to move back to her hometown--a white, tight-knit town in western New York--when she becomes the guardian of her nephew. Here she experiences a chain of events that makes her question who she is--and what is of real importance in life. As light as this may sound, you should know the novel is deep on many levels (not heavy deep, but makes you think about things the way you did when you read THE LOVELY BONES--if you finished it, I mean.) This is literature--and a book that will leave you thinking. This novel is wonderfully written and edited to the core--seriously. I found it a relaxing and delightful read--and refreshing from style to plot points. And at $18 (at Amazon) it's cheaper than a DVD and you'll get more entertainment out of it. And trust me that it will make a sweet holiday gift.